When talking about the Rolex Submariner, you tend to run out of superlatives very quickly. It is, without doubt, the most instantly recognizable dive watch ever made. It is, quite probably, the most instantly recognizable watch of any kind ever made. It is the best selling model from the world’s leading watchmaker. It has inspired more ‘homages’ (read: blatant copies) from more competing manufacturers than any other, and it also holds the dubious distinction of being the most illegally counterfeited watch. There are estimated to be more fake Submariners doing the rounds than the real thing. It is a legend six decades in the making, and more often than not the first port of call for every aspiring Rolex collector. The Sub, along with the Datejust, is the watch that best exemplifies everything Rolex stands for. From that debut reference at 1954’s Basel Fair, most of the alterations the brand has made have been the ones you can’t see. The aesthetic blueprint has stayed relatively unchanged, mainly because they got it right in the first place. The only real outward revisions have been crown guards in the 1960s, and the addition of a date function, but only for those who want it. No-date Subs are still very much in the contemporary catalog for the purists. But the watch has nonetheless evolved dramatically over the generations. While the styling might be classically timeless, the engineering remains right at the cutting edge of what is possible in mechanical watchmaking. Rolex’s calibers are, quite rightly, considered the pinnacle of accuracy and reliability, and the brand leads the industry in the development of new materials, for use either inside the movements or for cases and bracelets. It all means the Sub is still one of the most capable dive watches available today. The initial 100m water resistance quickly became 200m, and since the end of the 1970s, 300m. The steel versions have always been forged from the strongest metal obtainable, first 316L and now the insanely tough 904L. Of course, a strong argument can be made for all these talents being somewhat academic. It is a rare occurrence these days for a Submariner to be bought because the wearer needs a trusty companion on their next underwater exploit. Rolex many years ago conceded the Sub was no longer used as the robust tool watch it was originally designed to be. Its party piece of looking equally well-matched to a wetsuit as it does to a tuxedo as to a t-shirt and jeans has led to the ultimate diver spending the vast majority of its life on dry land, perhaps venturing as far as a dip in the hotel pool if it’s lucky. It is the reason Rolex has launched it in precious metal editions alongside the robust steel versions, and you will find pieces in both 18k yellow and white gold as well as Rolesor, with some attention-drawing colors beside the archetypal black and white. Similarly, references with diamond-accented hour markers have surfaced from time to time, underlining the fact that this is far more status symbol than vital life-saving dive equipment. None of that really matters though. The Sub’s story was written a long time ago and has since crossed over into pop culture folklore, its reputation helped immeasurably by being the timepiece of choice of a certain British super spy. James Bond trusted to the Submariner in a total of nine secret missions, going from versions that merely told the time to Q’s uprated rope-cutting, bezel saw model. No watch was ever given a more perfect advert; 007’s effortless switching from suave and debonair to all-out street brawler perfectly mirrored the Sub’s chameleonic qualities. It was then, and it is now, the only watch you will ever need. Read on below to learn all you need to know to take possession of the one and only Rolex Submariner. Just about the most popular luxury watch in the world for the last 60+ years, it should come as no surprise that a lotof Submariners have been made over that time. And that equates to a pre-owned market awash with examples just waiting to be snapped up. You will have no trouble at all finding a Submariner to buy, but just because there are a glut of them available, doesn’t necessarily mean they are being given away. Starting price is still around the $6,000 to $6,500 mark. For that you will find plenty of 1990’s era no-date steel models, possibly about the most purely Rolex watch around. While that might seem to be bordering on the high end for a time-only, non-precious metal piece, it is the Sub’s unassailable reputation that stops the price from falling any lower. People will always want a Submariner, and it means even the least expensive models can be reasonably assured of making their money back in the future if owners decide to sell or trade up. At the top of the scale, it is really a question of how much you would like to spend. There are some exquisitely rare examples out there, vintage gems that start in the six figures and only go north. Of these, few have as fascinating a history, or send quite so many hearts fluttering among collectors, as the so-called MilSubs. As the name suggests, these were military-issue watches; more specifically, those commissioned by the British Army and Royal Navy. Starting as far back as 1954, small handfuls of modified Submariners made their way to the front line, a practice which continued until the 1970s, taking in four different references. Today, those special examples, some of which number barely into double figures, represent the holiest of holy grails for Sub enthusiasts. A more down to earth option, particularly for those interested in possible investment potential, are the standard Rolesor models. This combination of steel and gold is a definitive Rolex look from as far aback as the 1930s, but didn’t first emerge on the Submariner until 1983 with the ref. 16613. Always an opinion divider, these half and half pieces are very much of their time and have been out of favor for a while. But we are seeing fashions go full circle recently, as they always do, and other Rolesor watches in Rolex’s vintage lineup are starting to attract a lot of attention. We would not be surprised to see the Sub’s two-tone offerings go the same way, leading to a sharp increase in prices. One to consider sooner rather than later. There are a number of other alternatives on the main theme to contemplate as well, watches with a host of unofficial monikers like the Hulk, the Kermit and the Smurf, all coming in at various price points. Don’t worry, we will go into much more detail later on. Once its popularity started to soar during the early 60s, the Submariner began appearing in a slew of different guises, leaving collectors to ponder over a wide and varied options list. At its most basic level, you can choose between a date and a no-date model. For the first 12 years, the Sub had no extra features, not even one as modest as a date function. When it was introduced in 1966 on the ref. 1680 it immediately split devotees down the middle, not so much for the complication itself but because of the Cyclops over the window at the three o’clock. The magnifying lens has been a bone of contention among brand followers since it debuted on the Datejust in the 50s, leading many to complain it ruins the symmetry of the dial. Never a brand to bow to public opinion, Rolex continued to add the Cyclops to practically the whole of their range, but did make the concession with the Sub of still offering a time-only model. The watch has been forged from a number of metals during its lifetime. Exclusively cast in stainless steel to begin with, the first all yellow gold version arrived in 1969 with the ref. 16618. However, it had to wait until as recently as 2010 for white gold to make its entrance. Both are still popular editions in the contemporary lineup, along with the Rolesor models we looked at earlier. Beyond that, the distinctions between all of the various Sub references have been particularly subtle. The handset changed from a pencil style to the Mercedes design still used today within a couple of years of the watch’s release. Similarly, with the exception of some ultra rare and usually military-issue pieces which had the Explorer’s 3/6/9 indexes, the Submariner’s hour markers have consistently been the mix of circles and batons with which we are all familiar, with the inverted triangle at the 12 o’clock. The lume material has, of course, been upgraded over the years. In 2009, the bezel switched from an aluminum insert to Rolex’s patented Cerachrom. Interestingly, the rotating bezel, a trademark of the brand, only became unidirectional as recently as 1981. An important safety feature for divers, only turning one way means it guards against unintentionally overestimating how much longer air supplies will last. Until then, the patent for the design had been held by Blancpain, who came up with the idea for their Fifty Fathoms. The bracelet, unlike several others in Rolex’s tool watch family, has remained steadfast to the Oyster, the most utilitarian of the brand’s options. The dial, most commonly found in black, has also been issued in a range of other colors. Blue dials date back to the 80s, first seen on the Rolesor ref. 16613 along with a matching bezel. There is an all-yellow gold version with blue face and surround from the same era as well, and both are still part of the modern catalog. Green was introduced on the Sub with the 50thanniversary edition, the ref. 16610LV from 2003. A longtime brand emblem, the color was limited to just the bezel on the birthday watch, leading to its affectionate Kermit nickname. It was replaced seven years later with the appropriately labeled Hulk, which added a green dial as well. One other type you will run across are the Serti dials. Taken from the French word ‘sertir’, meaning ‘to set’, it refers to the very distinct gem decorated dials of several Rolex watches. Another anomaly from the 80s, the Serti dials are no longer produced, but are still plentiful on the pre-owned market. Distinguished by eight diamond hour markers, the Submariner also has three sapphires at the cardinal points. Despite rumblings from the brand faithful, and particularly its younger members, the Sub has stubbornly refused to grow beyond its traditional 40mm body. That is the size it has been since 1959, when the arrival of crown guards bumped it up from its original 38mm. In some corners, that is seen as just a little on the small side for a modern diver, and Rolex has gone someway to addressing the concerns in recent years with the introduction of the Maxi case. Since 2009, the Sub’s lugs, as well as its crown’s protective shoulders, have nearly doubled in thickness, giving the watch as a whole a far bigger presence on the wrist. For others, the pre-Maxi case examples remain the classic look for the Submariner, and have garnered the watch an appreciative audience among both genders as well. With more women wearing models originally targeted at a male audience, the Sub is becoming a much more unisex option. It was the Submariner that ushered in the first real golden age for Rolex. Emerging in the mid-fifties, it was conceived to capitalize on the new sport of recreational Scuba diving, and the man we have to thank above anyone is former company director René-Paul Jeanneret. Himself a keen diver, he was the first to tout the idea of a watch tough enough to wear on underwater adventures, while still stylish enough for everyday. By this time, the brand was already way ahead of the competition when it came to waterproof timepieces, having perfected the Oyster case in the 1930s. They had also collaborated extensively with Panerai to build models for the Italian Navy, resulting in the Radiomir. All those decades of development and expertise were poured into the Submariner, but even so, perhaps the only thing it can’t lay claim to is being the firstever dive watch. It is generally accepted that Blancpain beat it to the punch by a matter of months in the 1950s with the Fifty Fathoms. However, the Sub was the first to be officially rated waterproof to 100m. Fifty fathoms, if you wanted to be really pedantic about it, is 91.45m. As it does with every model in its catalog, Rolex has worked tirelessly to hone and refine every aspect of the Submariner since its release. With no great complications to worry about, this systematic improving has involved making the watch even more impervious to the water, as well as the most accurate timekeeper possible. The winding crown, notoriously the weakest point in any mechanical watch, has been uprated over the years. Originally fitted with two rubber gaskets that ensured water resistance down to 100m (known as the Twinlock system) it was upgraded in 1979 to the Triplock, giving the Sub 300m of protection for the first time. The calibers too have gone through some major revisions. Always automatic, in that they used the brand’s patented self-winding Perpetual rotors, the initial Aegler-supplied movements were quickly replaced by Rolex’s in-house 1000 series (the Cal. 1030 to be precise) and then by the iconic 1500 range towards the end of the 1950s. That was the family of calibers that saw the Sub through the introduction of the date function in 1969, with the Cal. 1575, and also brought the hacking feature that stopped the seconds hand when setting the time. Incidentally, it is not unusual to see Cal. 1575 movements marked Cal. 1570 if you were to open up the back of a date-equipped Submariner. Rolex frequently swapped and changed elements between the two during manufacture. The 80s marked the start of the high beat era, the new 3000 series debuting the now-standard 28,800vph balance frequency along with the Quickset date system. Since then, it has just been a matter of periodically adding new and enhanced materials, both inside and out. Ceramic bezels arrived in 2009, a virtually indestructible substitute to the previous aluminum inserts. Within the latest movement, the Cal. 3135, lives the Parachrom hairspring, made from a niobium and zirconium alloy of Rolex’s own devising that shrugs off shocks and magnetic fields, two of the biggest enemies of mechanical calibers. The Sub has come a long way over the last six decades, and will continue to do so. As the most popular model in the fleet, it will be granted ever greater additions, keeping it at the head of the table of luxury dive watches. Alongside the Daytona and fellow diver the Sea-Dweller, the Submariner is among the most collectible of any watch in the Rolex stable. Its turbulent early life, with the brand seemingly experimenting endlessly in order to get every element exactly right, threw out ten separate references in the first decade of production. While none could be described as plentiful on the vintage market, there are some that redefine the word rare. Strangely, there has long been an argument over which was the first model released. The ref. 6200 and ref. 6204 both came out almost simultaneously, the former fitted with a larger 8mm crown that gave it a 200m water resistance, as opposed to the standard 6mm of the latter, rating it down to 100m. The pair were only made for a very short time, replaced by the similarly fleeting ref. 6205, which differed from the 6204 only in the shape of its handset—replacing the pencil style with the time-honored Mercedes. With such a brief manufacture, all three qualify as extremely scarce, but even more uncommon is a reference from 1955, the ref. 6536. This is seen as something of a transition piece, the small crown version of the ref. 6538, the watch Sean Connery wore as he set about fixing Dr. No’s wagon. Estimates put the number of 6536’s in existence at around 100. James Bond’s Submariner is obviously especially desirable too, with examples selling for deep into six figure territory. The ref. 6538 is sometimes referred to, erroneously, as the first of the ‘Big Crown’ Subs. The final pair of references released without crown guards, the ref. 5508 and ref. 5510, were only made in the hundreds rather than the thousands like later references, but you will still be able to find them for sale quite readily. Prices, however, can get astronomical. What followed on from that piece are a duo of Submariners with two of the longest production runs of them all. The ref. 5512 emerged in 1959, complete with guards for the crown, a model still being made until 1978. Outdoing even that, the ref. 5513 was launched in 1962, ostensibly identical to the 5512 but never given a COSC-rated movement and therefore the cheaper of the two. Over its 40-years in the catalog, far more of the 5513 were made and today it acts as an accessible and very popular gateway into the world of vintage Rolex collecting. The last great upheaval to the Submariner was introduced in 1969, with the arrival of the ref. 1680 and its date function, along with the controversial Cyclops. Although pricier than the 5513, this historically important chapter in the Sub’s story is still more attainable than you might imagine. There are, as anyone with a passing interest in Rolex collecting will know, little subsets within all these different watches that have tiny discrepancies which can put their resale value through the roof. The first run of the 1680, for instance, have ‘Submariner’ printed in red, adding on massive premiums over the more usual white writing. Some model references have the depth rating shown in meters first, others have a small dot under the baton at six o’clock which have become known as the exclamation mark dials. We looked at the models issued to the military earlier, the MilSubs consisting of specially modified 6538, 5512 and 5513 pieces and the custom-made 5517. And don’t forget the 5514, the prototype forerunner to the Sea-Dweller, essentially a standard 5513 retro-fitted with a Helium Escape Valve and never officially released to the public. Of the most recent run, the more colorful pieces remain excellent targets for collectors and investors alike. The Hulk is still being made, as is the so-called Smurf (a stunning white gold model with blue dial and bezel) and so don’t yet have the all-important exclusivity factor. But the Kermit, the 50thanniversary release with its green surround, was discontinued in 2010, triggering an upsurge in prices for pre-owned models. All these watches, and many many more besides, exist in greater or lesser numbers and there are enough differences between them to fill a coffee table book. The key for those wanting to secure themselves a vintage Submariner is to do as much homework as possible. As we said, there are oceans of counterfeits out there, and it is imperative you trust your seller completely. The history of the Submariner starts with René-Paul Jeanneret, one of Rolex’s board of directors and an avid diver. He was also, coincidentally, a close friend of Jacques-Yves Cousteau, and it was with the great oceanographer’s input that the first model of the Sub was made. That initial release, either the ref. 6200 or the ref. 6204 depending on which version of the Rolex chronicle you adhere to, was unveiled in 1954 at the Basel Fair. With its rotating bezel (borrowed from the previous year’s Turn-O-Graph) robust case, matte black dial and lume-drenched indexes and hands, it was marketed at both professionals as well as the new breed of recreational diver—and the then unheard of water resistance of 100m put it out way in front of its meager competition. There followed a decade of small revisions being made to the watch, Rolex recognizing they were dealing with perhaps their first true icon, and pouring every last ounce of their hard-won and formidable expertise into it. Just two years after its first appearance, the Sub became standard issue to the British Royal Navy who, after extensive testing in the field, suggested a redesign of the bezel so that it overhung the case, making it easier to turn while wearing gloves. Rolex duly altered the component, also changing the former coin-edge styling to a more serrated edge. The new bezel type was adopted on all subsequent civilian watches too. By the end of the 50s crown guards had made their way onto the Sub, giving it the silhouette we recognize today. The 60s saw the Submariner gain a date function and also be adopted by James Bond, securing it once and for all as the single most desirable timepiece it was possible to buy. 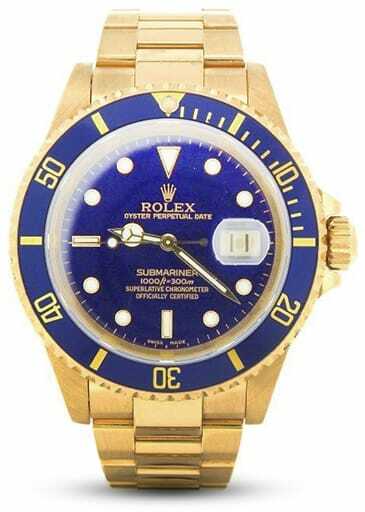 This rank led to the first of the gold versions arriving in 1969, leaving the real diving duties to the recently released Sea-Dweller, and elevating the Sub into the realms of status symbol. Even so, the innovations continued. 1979 marked the arrival of the Triplock crown along with the watch’s first sapphire crystal, bringing with them a new depth rating of 300m. Two years later, the emblematic rotating bezel was altered to be unidirectional, adding another layer of safety for divers. The Cal. 3135 was fitted in 1988, a true workhorse of a movement which still powers the Sub today. It too has been given little additions over its long service, with the likes of the Parachrom hairspring in 2000. 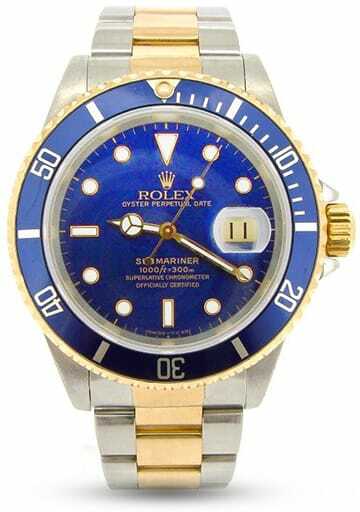 Rolex celebrated half a century of the Submariner in 2003 with the ref. 16610LV (Lunette Verde), complete with green aluminum bezel, before the range was switched over to the brand’s patented ceramic material, Cerachrom, in 2010. That year also brought the Maxi case, making the Sub even more brawny in appearance, with fatter lugs and crown guards. It has brought the all-time classic shape into the modern day, still very recognizably the style that started it all, but updated for contemporary tastes. Undoubtedly one of the most important watches of all time, the influence of the Rolex Submariner is impossible to overstate and it continues to be an object of desire to any horology fan. Whether you opt for a recent or vintage example, no collection is complete without one.